Miniature cup brushes are most commonly used in hard to reach areas that require precision deburring and finishing. 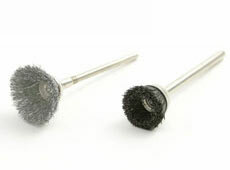 Brush Research Manufacturing's miniature cup brushes are made for light deburring, blending surfaces and light cleaning. Available in three diameter sizes and a selection of materials, these cup brushes are perfect for your tightest applications. If you're interested in learning more about Brush Research Manufacturing's high quality miniature cup brushes, contact a distributor today. 82B-403 9/16" .005 crimped steel 3/32"
82B-404 1/2" .003 crimped steel 3/32"
82B-405 5/8" .003 straight steel 1/8"
82B-407-1 9/16" Hog Bristle stiff 1/8"
82B-407-3 1/2" Hog Bristle stiff 3/32"